We are happy to inform you that Breadcrumbs Manager now supports Joomla 1.7! The new version of Breadcrumbs Manager is 1.7, reflecting the Joomla version. Who can get the new version? As always, all of our customers who purchased previous version of the product, can download the new versions for free. How to get it? If you are an existing user, just log in to your account and head to the download section of Breadcrumbs Manager. You will find all installation packages there. If you are a new customer, proceed to the online purchase page. What has been changed? A few small adjustments were made to reflect changes in Joomla 1.7. No bugs are currently known. Other news. 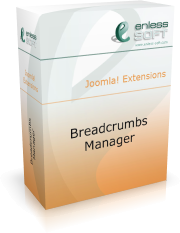 We also released an evaluation version of Breadcrumbs Manager for Joomla 1.6 and 1.7. Previously, only Joomla 1.5 evaluation was available. An evaluation version is fully working version which expire after 20 days. This is a great way to see if the product works for you, using your own real-world environment. If you decide to give it a try, we will be happy to assist you on the way. Please note: the evaluation versions are encrypted and require the free ionCube loader to be installed on your server. That’s it for now. If you have any questions, do not hesitate to contact us. We are happy to inform you that Breadcrumbs Manager now supports Joomla 1.6! The new version of Breadcrumbs Manager is 1.6, reflecting the Joomla version. Who can get the new version? The great news is that all of our clients that have purchased the 1.5 version can get the 1.6 version for free! We decided to give 1.6 version to everyone even if their upgrade period has expired. How to get it? If you are an existing user, just log in to your account and head to the download section of Breadcrumbs Manager. You will find both 1.5 and 1.6 installation packages there. If you are a new customer, proceed to the online purchase page. What has been changed? Since Breadcrumbs Manager is a mature product now, there is not much to be changed. No bugs are currently known. Anyway, there were some changes due to the new model of Joomla 1.6. As you probably know, sections do not exist anymore. They were replaced by hierarchical categories. This is why the built-in “Current section” breadcrumbs item, which was used to get a link to the current section was removed. It was replaced by a new item, called “Current category path”. It can be used to display the current category and all its parents in the breadcrumbs. That’s it for now. If you have any questions, do not hesitate to contact us.